Every weekend between 1906 and 1912 the leaders of the ‘suffragette’ campaign for the vote for women came down by train to Holmwood. 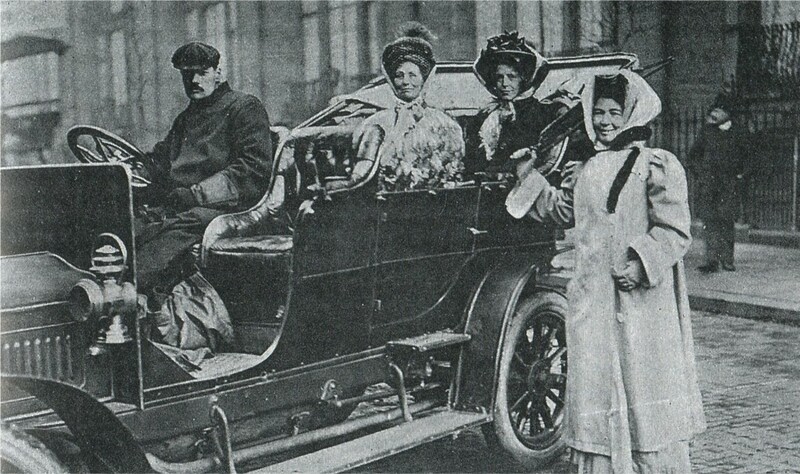 Mrs Pethick-Lawrence, standing, with Emmeline Pankhurst and Annie Kenney, with Holmwood driver, Mr Rapley, (who was famed for his discretion about suffragette matters), at the wheel. The Pankursts were frequently in Holmwood. Emmeline was imprisoned seven times for the cause. 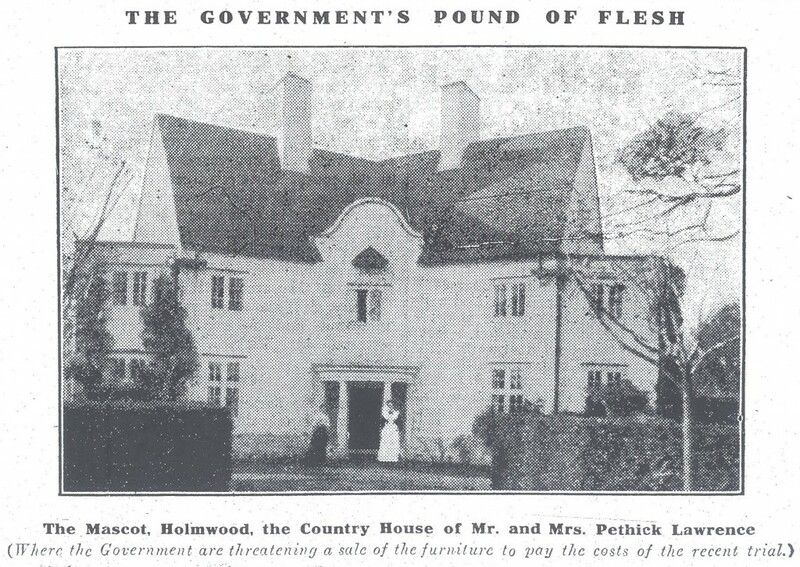 The Mascot (now the Dutch House) in South Holmwood, home of social campaigner Emmeline Pethick-Lawrence and her husband, Frederick, was the country home of Mrs Pankhurst’s Women’s Social and Political Union. Women recovered there from forcible feeding and campaigns were planned there. Emmeline led the WSPU with Mrs Pankhurst. She devised its purple, white and green colours; and, with Fred, she edited ‘Votes for Women’. It was her fundraising and organisational skills and Fred’s wealth that enabled the WSPU to make the impact that it did. Until their split over escalating property damage in the campaign in 1912, when Fred and Emmeline were dismissed from the WSPU, Emmeline was one of the three acknowledged leaders of the movement. The organisation’s treasurer she always marched at the front of processions with Mrs Pankhurst. In 1912 Fred and Emmeline were convicted with Mrs Pankhurst of conspiracy to commit criminal damage after a window smashing campaign. They were both imprisoned and forcibly fed. 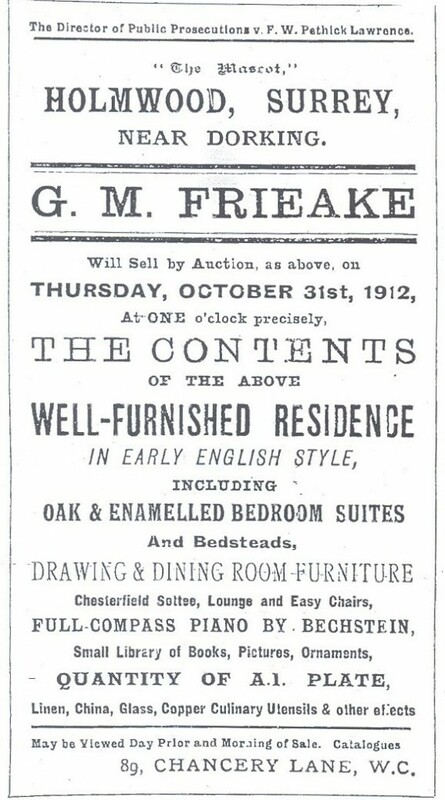 When Fred refused to pay the costs of their prosecution, the government put bailiffs into the Mascot and auctioned the contents. 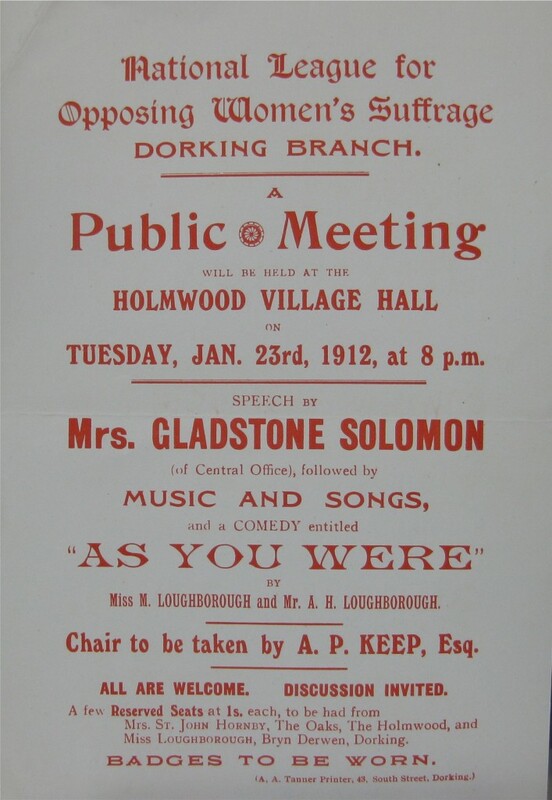 For six weeks suffragettes conducted a campaign in Dorking and Holmwood to embarrass the government. They held rallies in Holmwood, Ockley, Westcott, Bookham and, nightly, in Dorking. Organiser Charlotte ‘Charlie’ Marsh assured worried tradesmen that there would be no window breaking spree. 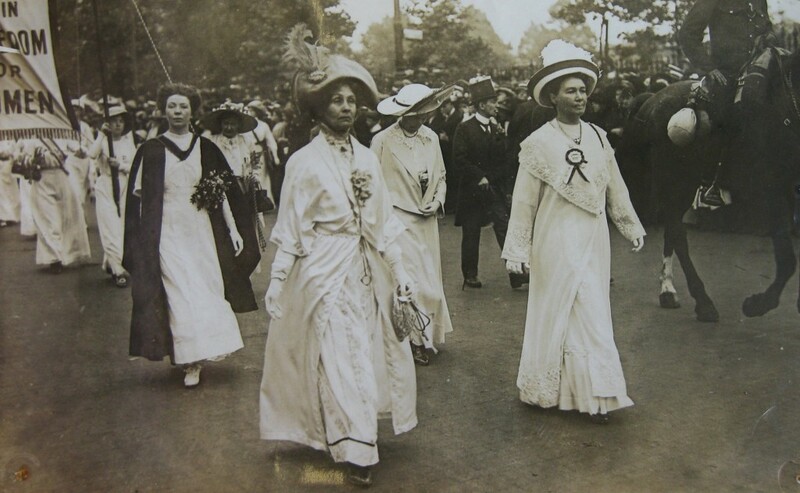 On 31st October 1912 3-4,000 people gathered for the auction, many coming down by train in suffragette colours. Most of the couple’s possessions were bought back by supporters. The Pethick-Lawrences spent the rest of their lives campaigning for freedom and equality, for the rights of women and the welfare of children. Entering parliament as a Labour MP after the First World War, Fred became 1st Baron Lawrence of Peaslake in 1946. A long time friend of Gandhi, he negotiated Indian independence as Secretary of State for India in Attlee’s government.